Although we’re known for our work with private homeowners in the Western New York area, our talented team at A.G Roehrig & Son works with business owners and landlords to provide their tenants and customers with the most comfortable experience possible. Here’s a behind-the-scenes look at one of our latest commercial projects for a four story, 40-unit building in an old Section 8 building on Niagara Street. This apartment building had seen better days, and we’re part of an on-going project to improve the area. 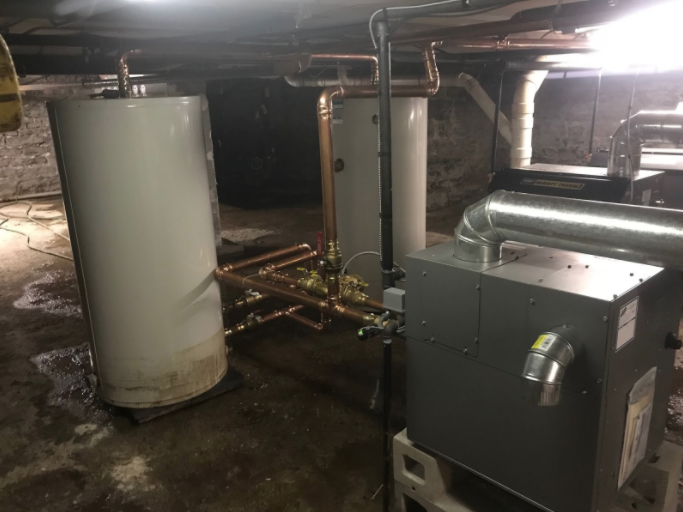 Within this building, we used two 400,000BTU Laars Mighty Therm Copper Fin boilers for the building heat and one 300,000BTU Laars Mighty Therm Copper Fin boiler responsible for maintaining 240 gallons of drinking hot water. These heating boilers are controlled by an automated system that automatically switches the two heating boilers lead and lag. One boiler comes on first, then the second one if needed. To maintain equal run time, these boilers alternate in this pattern as needed. In this picture, we can see the Domestic Hot Water Boiler (DHW) and the two 140 gallon storage tanks to its side. Both of these tanks were already existing and able to be reused for this project. We were able to use our propress machines to mechanically seal all the joints, saving the customer time and money rather than soldering every fitting. When using propress fittings, it streamlines the scope of your project, there is less of a chance for leaks, and it can fit all your piping quickly with water still present in the system if needed. The DHW system also has a building recirculation line operated by a pump. Meaning that hot water will always be present anywhere in the building with no need to wait for hot water from the basement to get up to a shower or sink on the 4th floor. This can also be done on a smaller scale in a residential setting. We understand that timeliness is everything, so this job took us about a week with the switch over from the old system to the new system completed in a single 14-hour day. Because of the planning that our team does before the job begins, we used a team of four to finish this particular project without any problems along the way. In total. 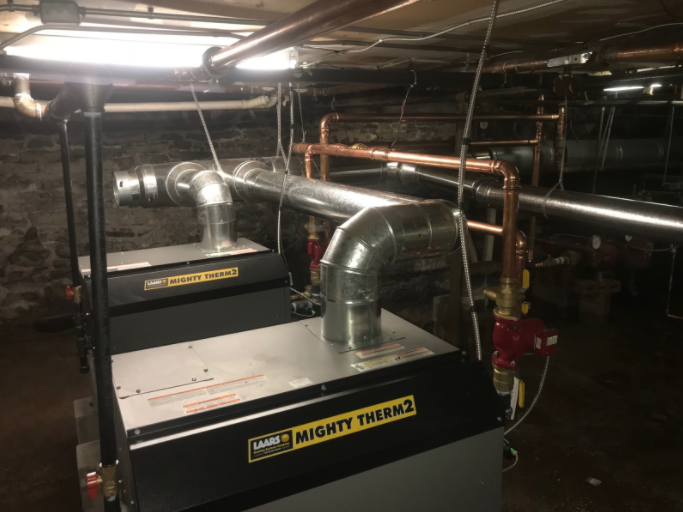 this job created 1.1 Million BTU’s worth of heat, which is a project scope that requires special licensing in the City of Buffalo. This photo shows both heating boilers piped together through a primary loop, which is feeding the main building circuit. These boilers are ran by an automated control. They switch roles of lead and lag boilers (1st and 2nd) so they both have equal runtime and neither is being overworked. The control also calculates the water temperature set point depending on the outside temperature, which it also monitors. The colder it is outside, the warmer the heating water. Likewise, the warmer it is outside, the cooler the heating water. This is a form of energy management that offers the most amount of efficiency out of the system. Q & A: What Training is Needed for an HVAC Job?